Adder Infinity ALIF1002P is a high performance single-link DVI, USB and Audio KVM Extender / Matrix Switch solution including a Adder ALIF1002T Transmitter and a ALIF1002R Receiver. Part of the ADDERLink INFINITY series, ADDERLink Infinity 1002 is a high performance KVM extender that enables you to locate your critical computing hardware in a secure and temperature controlled environment, isolated from the user work station. Configurable as a single head or single link, this extender provides pixel perfect video with minimal lag across a distance of up to 6.21mi (10km) via interchangeable CatX and Fiber SFP modules. This KVM extender can be used as a point-to-point extender, or integrated into a wider matrix system when combined with the ADDERLink INFINITY Manager (A.I.M.). With the addition of AdderLink Infinity management system (A.I.M. 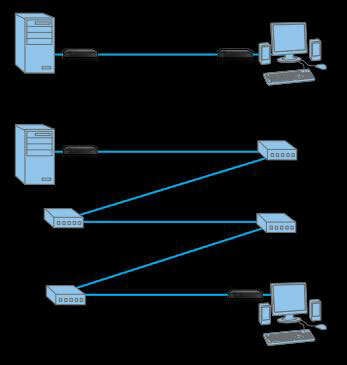 ), you can turn multiple point-to-point extenders into a truly scalable digital KVM matrix system that allows any workstation to link with any computer connected to the network. The AdderLink Infinity units were designed from the outset around a highly robust signaling method. This vital core asset is what gives you the freedom to use the full variety of cable links that you typically find within an average structured cabling system. The result is that you can achieve reliable links, regardless of whether the cables are CAT5e, CAT6 or CAT7. The AdderLink Infinity also offers the option of up to 6.21mi (10km) distances with fiber. Extension distance is not limited to a single 330 foot (100 meter) cable length - If you need to extend further, simply add a 1GbE network device to achieve an additional 330 feet (100 meters). This can be repeated many times. The units are also fitted with SFP cages to accept fiber optic transceivers which enable much greater extension distances. Enables connection of USB devices from mice and keyboards through to graphics tablets, jog shuttles, joysticks and 3D explorers, alongside mass storage devices. True USB Emulation Technology allows for faster keyboard and mouse switching. For applications where security is of high importance, the system has the ability to disable the use of non-HID devices, meaning there is no need to physically block USB ports to prevent the use of mass storage devices. Adder Infinity units have built-in security measures compliant with universal enterprise grade security standards inlcuding AES 256 bit encryption and RSA 2048 bit public key authentication. Intelligent EDID management allows the true characteristics of the monitor to be passed back to the computer. 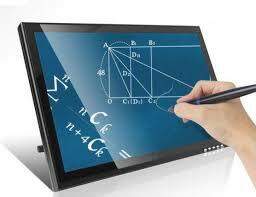 This ensures perfect video display without the additional configuration. Some graphics cards use a technique called dithering to give the appearance of a deeper color depth than is actually the case. As a result, dithering can significantly increase the normal video data rates. ALIF1002T has a feature called Magic Eye which supports dithering without allowing it to degrade overall link performance. AdderLink Infinity extender devices are delivered in a zero configuration state so you can plug them in and start working on them straight away. There is no need for drivers or software to be installed. 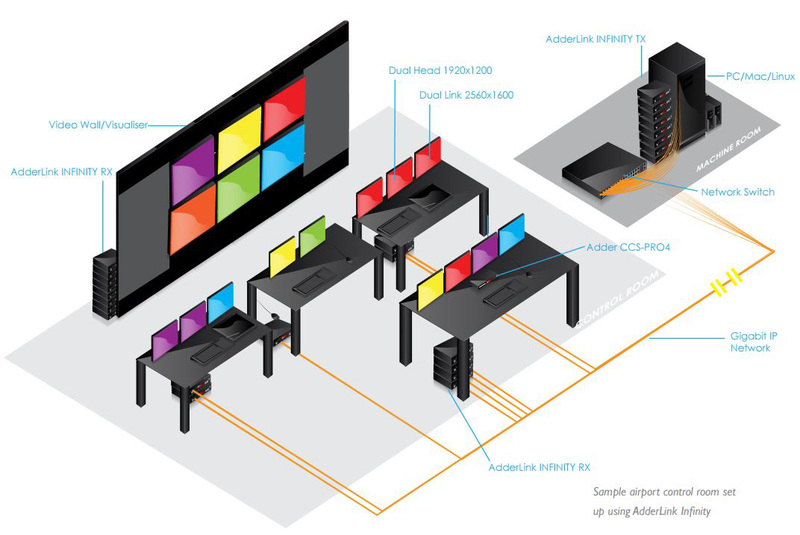 Adder Infinity units can be rack mounted (1 unit in 1U with RMK4S, or 2 units side-by-side in 1U with RMK4D-R2), left on a desktop, wall mounted (RMKV4), or attached to the back of your monitor using a VESA mounting carriage (RMKV4). 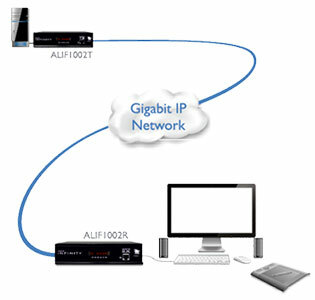 In its simplest form, you can use the ADDERLink INFINITY 1002 as a point-to-point extender. Simply connect a transmitter to an receiver using CAT6 cable up to 330ft (100m) in length. The Adder INFINITY 1002 also offers the option of up to 6.21mi (10km) distances with fiber, via optional fiber SFP modules. This will deliver video, Audio, USB and serial in perfect quality across much greater extension distances over traditional CatX cables. What if I need to extend beyond? For longer cable runs, simply add another network device such as a switch. This can be repeated many times for longer distances, delivering a video, audio and USB extender capable of extraordinary distances. 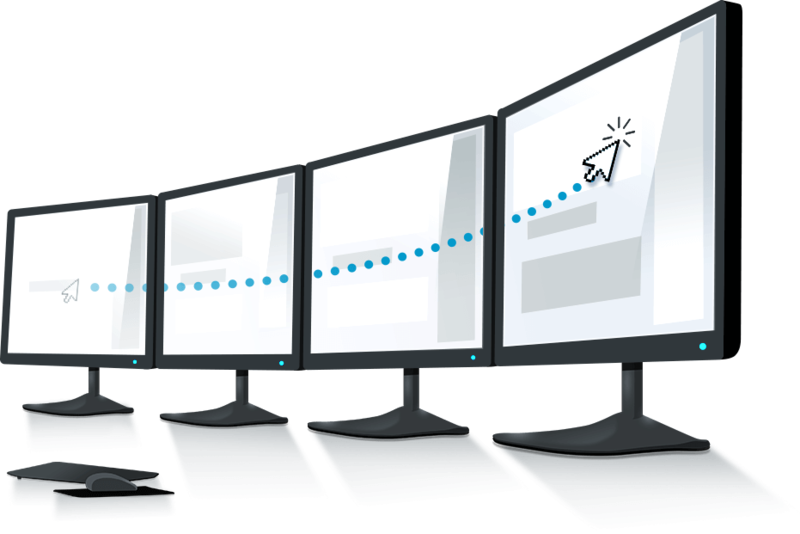 The great thing is, you can easily branch off to multiple screens at any point, or build new functionality in over time by adding additional units. Adder INFINITY units can be set up as point-to-point KVM-Over-IP extenders with unlimited extension distance. Access your source computer from anywhere in the world from an INFINITY receiver! 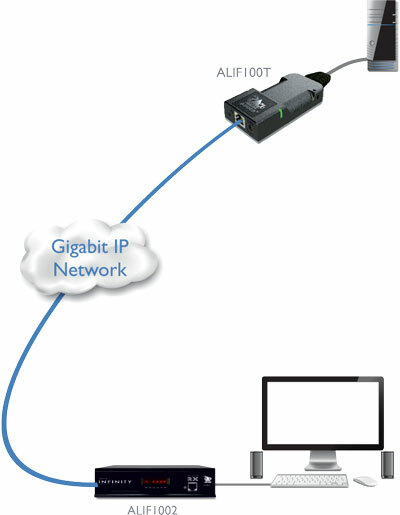 Optional VNC viewer access from a computer, mobile phone, or tablet is also possible using the INFINITY ALIF2112T Transmitter, or by connecting Adder iPeps IP KVM Gateways to INFINITY Receivers. 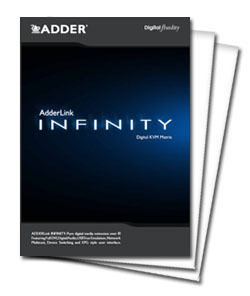 With the ADDERLink INFINITY, your network becomes your KVM switch. By changing channels on the receiver, you are switching video, USB and Audio, while the transmitters not in use continue to emulate the previously connected devices. By turning your network into a switch, you could potentially create a KVM switch of any size you like, you can add source computers simply by adding transmitters or users simply by adding receivers, and even share USB devices at the same time. By creating mixed channels, you can combine video, audio and USB from different destinations. 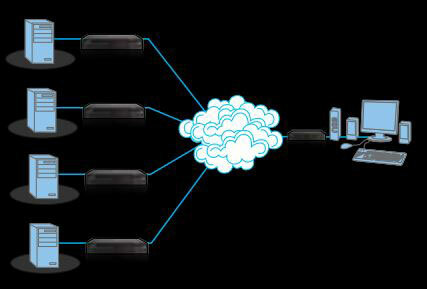 The ADDERLink INFINITY has been designed to allow multiple users to share a single remote computer. You are given three ways to connect; View only (shows video only), Shared (presents an open connection that others can use at the same time) or Exclusive (once selected, no other user can either view or share, with the exception of system administrators - configurable). 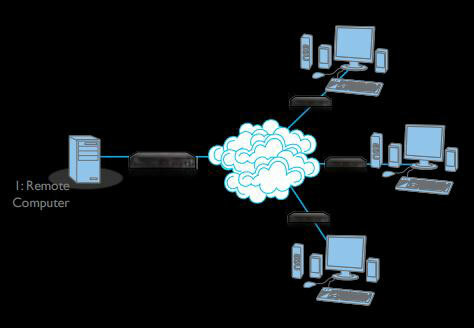 A unique feature of ADDERLink INFINITY is its ability to multicast video and audio across the network to as many receivers as you like. 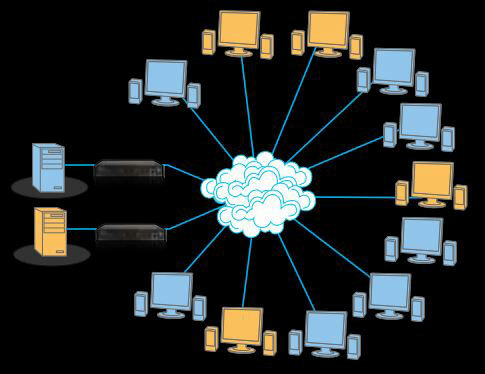 When a channel is being multicast, it does not create any additional traffic, instead, all receivers latch onto the same IP data flowing across the network. Adder INFINITY Manager (AIM) interface allows you to create custom command centers and video walls, without a limit to configuration size or distance. Mix together DVI, DisplayPort, and VGA Transmitters & Receivers that are available with a variety of mounting options, sizes, with audio support, and with serial RS-232. 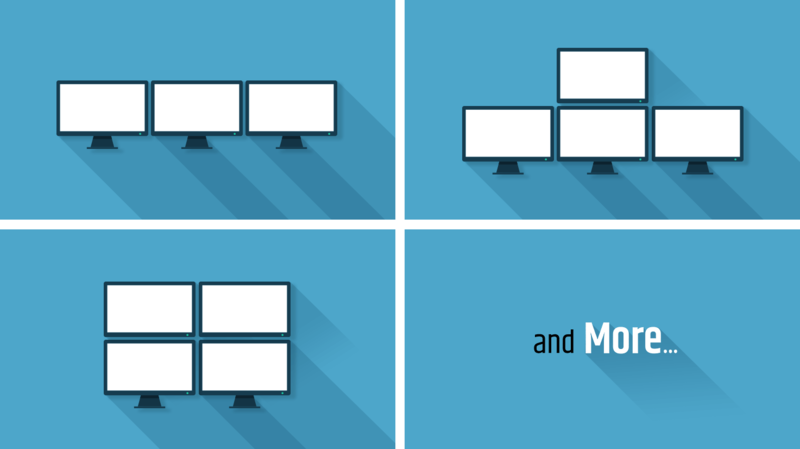 Control your entire IT & AV infrastructure, including existing KVMs, through a single solution! Free-Flow allows users to automatically switch between target computers simply by moving the mouse pointer from screen to screen. This essentially allows you to build a unlimited source Keyboard & Mouse switch. Unlike software-only variants, no software is required on your mission critical computers for Free-Flow to work. To add 'Free-flow' mouse switching to your control station, simply add another receiver & monitor to the user station for each source you want to switch between. Operating Temperature 0 to 40°C / 32 to 104°F. 100-240VAC 50/60Hz, 0.8A, input to power adapter. 5VDC 20W output from power adapter. 1 x 8p8c and 1 x SFP for AdderLink Infinity network connections. Audio, RS232 - requirement dependent. This part is also known as Adder ALIF1002P-US, ALIF 1002P, and ALIF-1002P.